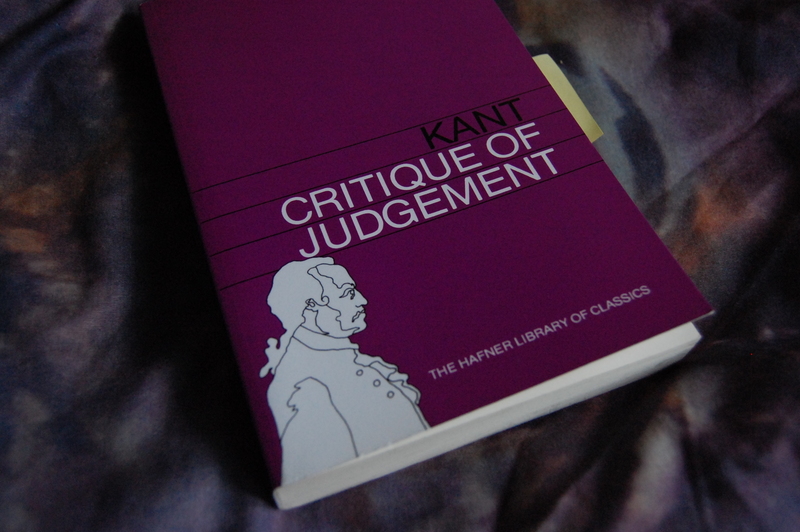 Since I’m interrogating judgement, there is no escaping Immanuel Kant‘s Critique of Judgement. This is an art studies textbook. Of course, few have actually read the entire text. I have read it, and now, after purchasing this from Fully Booked, have re-read it. 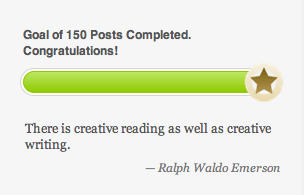 I spent three straight days on Kant. It does not get any easier. Hopefully, I get the time to write a review. I really am thankful for Fully Booked for locating this and transferring it to Trinoma branch for me. They are my absolute favorite for that particular service they provide with no hassle. Of course, I can’t shop for books without locating one that is for pleasure reading. Umberto Eco, needless to say, is a favorite of mine. 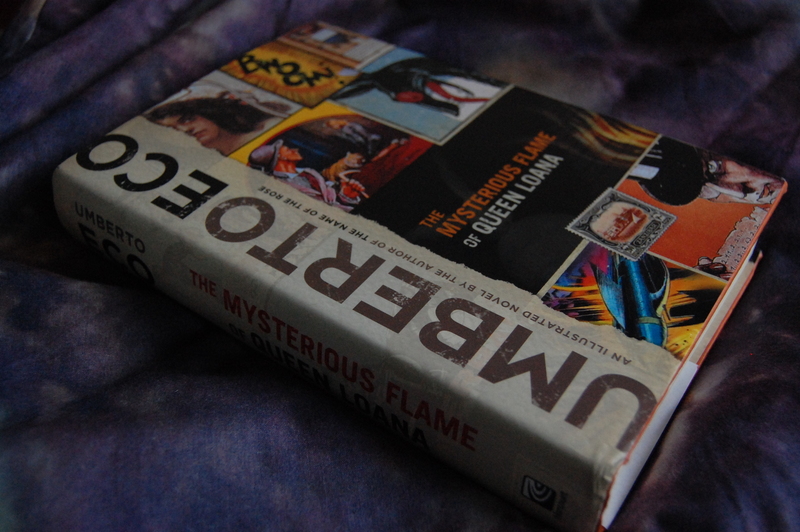 His illustrated novel, The Mysterious Flame of Queen Loana is something that I have been eyeing since last December. Powerbooks displayed it in a way that you couldn’t miss. Despite the hefty price tag of a hardbound Eco, it is still something that I have to purchase. Just looking at it makes me happy. I read it a chapter at a time so that it would last me a while. 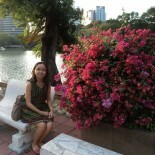 To keep myself from being completely broke with book purchases, I make use of our very reliable SC (Shopping Center). Somewhere in the heart of UP is an affordable copying service. Books that are too expensive to purchase, unavailable in the Philippines or borrowed from the Library and beloved Professors are cloned here. 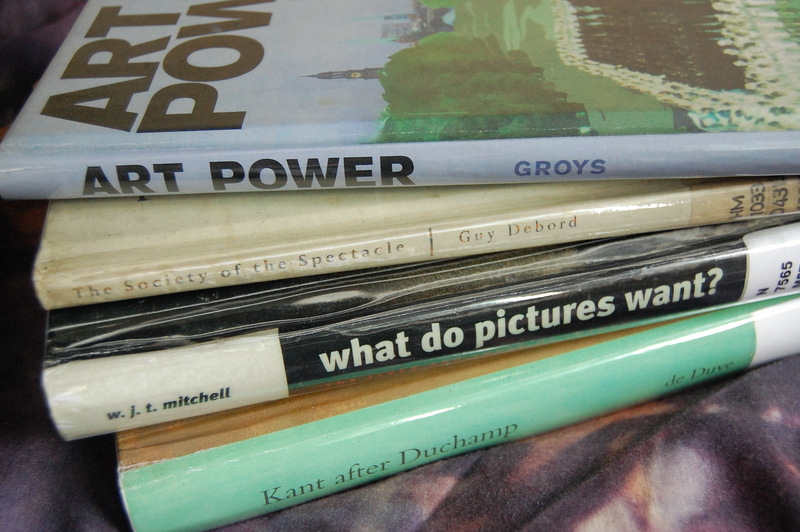 Recent clones include Boris Groy’s Art Power (amazing book, very new), Guy Debord’s The Society of the Spectacle (rare book), WJT Mitchell‘s What do pictures want? The lives and loves of images (critical book on my topic) and Thierry de Duve‘s Kant After Duchamp (incredibly hard to find, out of print book). All of which are helping me with the proposal. For my next post, hopefully soon, I will show the Milan Kundera‘s that I recently purchased, one after the other. By that time, I also hope that National Bookstore has already purchased the Terry Smith books that I ordered thru them. Getting my hands on some books, particularly the new ones, are really challenging. But even classic philosophy books are hard to come by. I asked Fully Booked yesterday if they can locate a copy of Walter Benjamin’s Illuminations for me, but unfortunately, they are out of stock in all branches. Maybe some of you can help me? This entry was posted on February 1, 2012 by Portia Placino in Diary of a Grad student, Random Writings and tagged Art Power, Boris Groys, Critique of Judgement, Guy Debord, Immanuel Kant, Kant after Duchamp, Mysterious Flame of Queen Loana, The Society of the Spectacle, Thierry de Duve, Umberto Eco, What do Pictures Want?, WJT Mitchell.